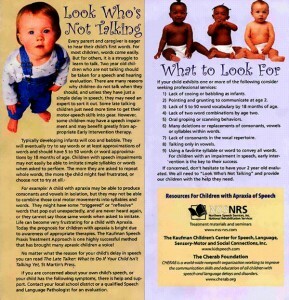 Northern Speech/National Rehabilitation Services, Inc.
Sensory-Motor and Social Connections, Inc.
CHERAB would like to graciously acknowledge the generous donation of these glossy brochures by Northern Speech Services with assistance from Nancy Kaufman CCC-SLP from Kaufman Children’s Center. These brochures were made up specifically to be handed out at the landmark Shafallah conference in Qatar that CHERAB was invited to which was in association with Newsweek magazine. CHERAB representatives Cindy and Khalid Mustafa attended amongst the hand selected guests which included such distinguished attendees and speakers as the prime minister’s wife Cherie Blair as key note speaker, Christopher Dickey, Regional Editor for Newsweek Magazine and Her Highness Sheikha Mozah Bint Nasser Al Misnad. Both Cindy and Khalid will be sharing more information and photos of their exciting first class trip to the Shafallah conference in Qatar soon! ← Twins, One Has A Speech Delay And One Doesn’t!